Refreshed: 6/12 – hours, text. Major update on its way! A few weeks ago I was enjoying a quiet cup of coffee at Fleur de Lis Bakery, when I overheard two women at the next table talking about “Food Dude”. This has happened to me several times, and I always enjoy hearing what people have to say. “You know his secret”, said one woman. “He is really a she; it is all part of the disguise!” She said it with such conviction; I had a sudden urge to go to the restroom, just to check. Thus was my introduction to one of the newest entries in Portland’s burgeoning bakery market. Greg Mistell was the original owner of the Pearl Bakery, which, at one time, many considered the best source of bread in Portland. In 2006, he left Pearl and opened a new bakery in the old Hollywood library building at NE 40th and Hancock. When I heard, I dropped everything and drove over to Fleur de Lis to check it out, even though it was late at night and I knew it would be closed. Since then, I’ve been eating my way through their pastries, breads, and sandwiches – It’s a tough job, but someone has to do it. The space itself is very nice and relaxed. It retains its library roots in the architecture of the building. Tall floor to ceiling windows allow light to spill into the room. It is very large; I could easily foresee this turning into a popular coffee house-type space with live music if Greg so desired. There is an array of comfortable tables and chairs, a mix of two and four tops, plus a few large tables and a sofa or two. The kitchen itself takes up a small corner; I’m surprised they didn’t make it bigger and can’t imagine how they manage to turn out so many items! The staff seems to be made up of family and friends. It is obvious that everyone there has their heart and soul into making it a success. All in all, it is a comfortable relaxed space, and I have enjoyed my time there. First the basics. Coffee and coffee drinks are available, all Stumptown blends. There is a large selection of different pastries: airy little apple puffs, flavorful rhubarb tarts, wonderful scones – maybe the best in town – are available every day. For almond lovers, the almond ring is a winner, exactly the way it should taste on a perfect crust. The croissants are flaky, light, and buttery without being oily, unmistakably authentic. The pain au chocolat has a good amount of excellent bittersweet chocolate running through it. One of these and a cup of coffee and I’m set for the morning. Other notable offerings: walnut pecan rolls, cinnamon rolls, pecan coffee cake, apple mazurka , blueberry scones, orange-currant scones, banana-walnut scones. Note that the choice is better if you get there early in the day. Next we come to the sandwiches. They have a good house-roasted pork loin sandwich with decent cheese, roasted onions, thin slices of beets, and a very light coating of mayonnaise on fresh, soft bread. The same goes for their Black Forest ham, which has the expected traditional ingredients. Other sandwiches available on a recent weekday include basil, tomato, and mozzarella; turkey with cantel cheese and cranberry; ham and gruyere; tuna salad; and finocchio with salami. They come with potato chips and a few slices of mandarin orange. There is also a soup de jour; this week it’s rustic tomato basil. If there is a weakness, it is with the coffee drinks. While they have good house coffee, the specialty drinks need lots of practice. Hopefully Greg will send someone to barista school, as this can be a great source of revenue when correctly executed. 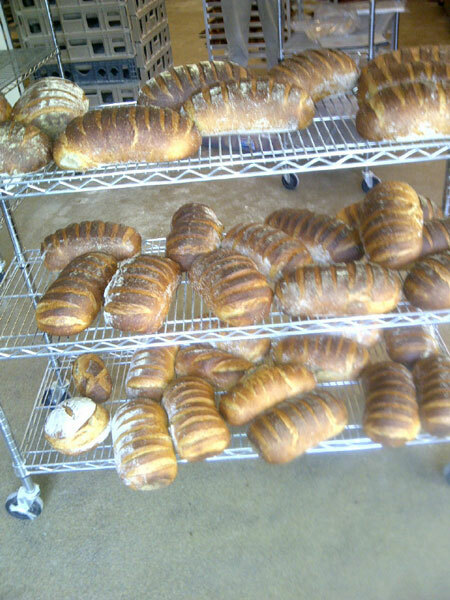 The breads are excellent too; I’d say right up there with the best in town. 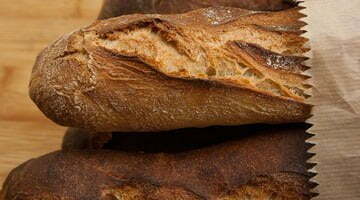 Their normal stock includes panini, multi-grain rolls, olive ciabatta, and levain. I’ve bought lavain a few times and ended up eating half of it in the car on the way home. Give it a try to see what you think. It is worth an expedition on a lazy day. When Greg gets the chairs and tables on the patio outside, it will be the perfect place to spend a Sunday morning. I Must say we’re very excited to see what Greg’s been up to….Can’t wait to try it….& you should add your opinion on the breads….this town is not that big of a bread town….everyone’s opinions matter & quite frankly should be heard by the bakers. Thanks Food Dude….we had no idea..just knew he was involved with the Hollywood Farmers Market. Hopefully he’ll add a Whole Grain bread! The Hollywood Business District has over fifty resturants and food outlets. However, Fleur de Lis, has emerged as one of the gems of not only this area but the rest of the city as well. Besides the observations about the baked goods, sandwiches, and beverages it needs to be noted that from the moment you walk in you know that you are amongst friends. You are greeted by a cheerful smile and a kind word by Liza, Heather or one of the growing number of staff who are being hired to meet the swell of customers. Greg is in the back furiously baking but takes the time to look up to see who has arrived at his ‘home’. Look around and see your neighbors; your business associates, the Grant High School students, passers by and many others, as well. It used to be we would have to travel to the Pearl Street Bakery for the coffee, baked goods and ‘community’. Now it exists in Hollywood. Welcome Greg, Liza and Fleur de Lis! Not being a Hollywood regular anymore, I was fortunate enough to stumble over this place last week (on my way to Starbucks!) What a great surprise! Nice atmosphere, very comfortable for the solo diner. I generally go for the chocolate or almond items, but since it was late morning, there wasn’t much left and I’m grateful, because otherwise I would never have tried the orange tart. What a great taste and such a flaky crust! I can’t wait to go back! Okay, fine. I like the bread. Love it actually. Just the right texture. Wonderful smell/taste. Best levain I’ve had in ages. Carrie: you are flat out wrong. I’ll admit, it is the blueberry scones that got me out of bed to go to the bakery this morning, but then I had a cinnamon roll. Those are amazing! The blueberry scones are merely terrific. My wife went in this a.m.–I had an incredible ham-and-cheese croissant, probably the best texture I’ve had in quite a long time. My wife had a caprese sandwich on PERFECT bread–chewy interior, crusty and buttery exterior. Mmmmmmmm. There were so many tempting looking things in the case that I imagine we’ll need a dozen or so more visits to form a more accurate impression, however! Its about the coolest thing to see, my best friend back to doing what he loves best! Hope they’ve improved their business smarts & customer service – I went in one afternoon with 2 friends not long after they opened. We were trying to decide what pastries to have, when the woman behind the counter announced, “We had a much better selection this morning.” Great, I’ll remember not to come in the afternoons. Then it took them a very long time to serve my friends drinks (hot chocolates – not that complicated). Counter staff was busy chatting with another customer (seemed to be a friend). We finally had to ask how they were doing. I haven’t been back since. Each and every day new customers discover Greg, Lisa and the ‘counter staff’ at Fleur de Lis to be the natural extension of excellent baked goods, sandwiches and the like. The long lines are proof that the earlier the visit the greater selection of the standard creations and the occassion surprise. What makes this place even more special is the fact that customers and staff are forming something akin to friendships. When I want my beverages, baked goods and customer service ‘corporate’ I ‘drive’ around the corner for the standard Big Green experience. Predictable and plastic and they are a ‘stickler’ for details. These new customers didn’t have that experience. And we were there instead of at Big Green exactly for the reasons mentioned. To be fair, we’ll try again. The multi-grain bread is outstanding. It is just like the bread we use to buy in Germany. Also, the pastries are just as good or better than anything we had in Paris. Greg is an outstanding baker. IHeartEating: I agree. Great bakery, but even if you get a coffee drink, it’s usually not very good. I think that was the biggest negative for me when I did the review. I’ve been to pretty much every bakery in Portland and simply cannot find any place that this this consistantly amazing no matter if you’re talking sweet OR savory, or just plain bread. Greg is an icon, no doubt about it. My complaint with this place is why does it take 10 min every time I order a latte???? Can they hire a barista, please???? I would have to say that I am drawn to the bread, pastries and sandwiches. I have nothing to add to the reviews above about their excellence. The one concern I have about Fleur is that while the service is incredibly friendly they are God-awful slow. Big lines are both a function of interest and service, and they somewhat fall down on the later. I think you can be a friend and also get people what they need in a reasonable amount of time. I keep coming back for the food, so I ran a bit of an experiment on the last three times I went. I was in line behind an average of three customers (lowest was 2 and the highest was five) and the average wait to the counter was 8 minutes, with the highest — the five customers — over 14 minutes. They could use some rethinking on how the actually take orders, plate the food and get it out the customers. Again, great people, very nice, but one last little thing. They often run out of bread and other pastries in the early afternoon. This can be quite frustrating especially if you want to pick something up for dinner and don’t have the time (children to school, work, etc.) to come early in the morning. They need to consider examining their demand for products over the full day and then providing extra in-demand products for the afternoon, rather than suggesting as one counter staff did that “you need to come earlier”. I am not sure that being in a service industry and requiring the customer to alter their behavior is a winning combination for the long-term. I live 3 blocks from Fleur de Lys. What a wonderful addition to the neighborhood. The last post is right, however, about slow counter service and running out of bread. Countering that, I once went in just before closing time to buy bread, was recognized as a regular customer, and given for free a 2nd loaf and pastries for everyone in my household. I have to say to ‘Love the Menu/Service a Miss’ that the wait per customer when they were busiest, based on your post, was less than three minutes per customer. I think that is fast service, and completely acceptable. Re: running out of things: if you had to bake every single thing on offer every single night, single-handedly, I reckon you’d have a different idea about ‘providing extra in-demand products’. But I’m admittedly biased, since I love the food and appreciate the friendly atmosphere, and assume that these two things will necessarily lead to occasional longer waits. I agree with Erin – this is a small family run bakery – similar to what you might find in France – quality matters not quantity and that goes for service and bread. I’ve been there quite a few times and often have to wait but the food is so worth it and I like that when it is my turn that the counter folks spend some time with me. If I were the owners I wouldn’t change a thing. They can’t be all things to all people. I’m actually encouraged to hear such a place exists in these times. Be still my heart at 9am. After dropping off the older kids at school, the baby and I often stop by fleur for a treat. I love the multigrain roll and he loves the cinnamon roll (I usually get half) On weekends we have to go early to get a breakfast panini or breakfast croissant. They have been known to be gone within the first 30min. of opening! I agree on the coffee issue mentioned *last year. * I stick with an Americano or the pot coffee. Consistently fine. My bakery snobby children love the salami sandwich or the caprese. Now with sliced fresh vinegar potatoes on the side. Yum! Sadly, I do not love the scone. Something is a bit bittery to me. Can’t figure it out yet. I highly recommend this place-we get smiles and hugs and quick chit chat from them each visit. oi, I can’t wait for tomorrow morning! This is kind of, well, emb. that I have posted twice in a row (because really, it had the potential to be a daily post about Fleur) Anyhow, my daughter chose to go here on our “date” today. She had the ham/cheese breakfast croissant and small cup of decaf w/cream and sugar. I had half a turkey sand. and coffee. I have to say, they do make a decent pot of coffee. Normally I do not care for the Hair Bender. Honestly, I am snooty about my coffee and don’t make pot coffee all that great myself. So, I was happy and impressed to have a nice, big, hot cup of it. The food was tasty as usual. Oh, and my daughter? She’s 7 and prefers Stumptown as well. Youth today. I cannot believe my bread-loving self has been unaware of Fleur de Lis until recently. I’m not sure if everyone is aware of how divine the almond croissant is, but it warrants a try for sure. Little Red Bike Cafe is extremely fortunate to be providing North Portland with some of the best baked goods I’ve ever tried. I am consistently amazed with the easy edibility of their ciabatta, as we use it at the cafe for several of our sandwiches. The only problem is that we are selling so many of our ciabatta-based sandwiches that we inevitably run out by the afternoon. Thanks Greg for making my mornings with the orgasmic smell of fresh cinnamon rolls and almond croissants! While I think the croissants are as good here as anywhere in Portland, they are not always availabe when you would expect then to be. The last two times I’ve gone to Fleur de Lis to enjoy their wonderful croissants (both times on weekend mornings) they’ve been out. As little as it costs to make criossants, it would be nice if they started to make a few more each day. Better to have a few left over than to not have enough and dissapoint customers. I’ll call and check on their supply before I go there next time. I have not tried any of their products but as Little Red Bike Cafe has just reopened and they are carrying their products. I am getting really excited. As a French native, I consider myself pretty lucky being in Portland, Oregon with a lot of different places carrying bread (even though it is more expensive than in Europe), it is not that common everywhere. Everybody here on that blog says it is the best in town so I can’t wait! If they are out of pastries, even though it is disappointing, it is a very good sign and I’d rather have a small business being out of something than trying to accommodate everybody by making more. That’s the frustration and beauty of a small business not trying to have everything available all the time. My wife and I just returned from this place. We have walked past it often and always wanted to stop in. The service here could not have been any worse. When we arrived there were not any other customers in line. I said “hello” to her and she looked at me like I was a GIANT walking inconvenience to her. She was not helpful at all in identifying the types of unmarked pasteries behind the glass. My wife and I were thrown back at how rude she was to us for NO reason at all. Rjay – I know just who you are talking about. FWIW she’s not always there – she wasn’t there at 10AM today when I was there. And everyone else who works there seems just fine (but no one is really overly effusive…). The pastries are fabulous. The bread is too. I really have no idea what her problem is – but she seems to be nicer to people that have cute kiddies (or little monsters, as I call them…).